I am going to have to fudge a bit on the challenge this week, since I do my genealogy research trips on holidays or between semesters. I have already blogged about a wonderful genealogy road trip in October 2008, that I took with a dear friend and it was on that trip that I got to do my first research in a county courthouse (cool! ), small town library (very helpful), and also the historical society of Steuben County New York (fabulous folks). As much fun and educational as that trip was, it had nothing to do with my family or my husband's family history, but it sure made me reinvigorated to get back at it! My most recent genealogy road trip was on Christmas 2008 and it was spent in my hometown of Castroville, Medina County, Texas. It has been many years since we last visited over Christmas as my husband and I now live in Maryland. In addition to being with my 3 brothers, their families and my parents, I also had in mind to make it to the church cemetery and take head stone photos as well as meet with a local historian, family friend and distant relative, Frances (related five different ways!). My husand and I departed from Baltimore to take the Southwest Airlines' nonstop flight to San Antonio, Texas. I lugged my laptop, scanner and luggage through the Baltimore airport and was happy to learn that our beautiful hotel, The Hotel Alsace Spa and Resort (sitting high on a hill overlooking my little hometown) had free wireless access. The hotel also had a spa, but alas, this was not the trip to take advantage of that luxory! My parent's home was filled with my brother's family who flew in from Denver, Colorado and some other grandkids who did not want to be separated from their 1st cousins! My two other brothers live in nearby San Antonio. The meeting with my mother's cousin, Frances, was entertaining and very educational, as it always is! Frances and another woman in Castroville, Connie, have become the de facto caretakers of the records of St. Louis Catholic Church. They also extensively researched their own families as well as other people in Castroville. Since I am related to both women, they are able to answer a lot of questions that I come up against! The visit with Frances was bittersweet because I had already met with her 2 years ago and scanned every photo that she had of our common ancestors (a lot!) but when my laptop was stolen from my home last fall, those photos went with the laptop. Thank you for people like Thomas MacEntee who encourage and educate people on backing up their data! I know better (I am a high school media specialist and give these "lessons" every day), but for goodness sake, I can't seem to follow all of my own good advice! So needless to say, I will be at the next Data Backup Day on Feb. 1st! As much as I did not want to be recanning photos that I already scanned previously, visiting with Frances for an afternoon is always a fruitful event and it was a chance for my mother, Frances and me to reconnect and get relationships and marriages straight in our records. I was excited to again view the photo (and then scan) of an early immigrant to Castroville, Carolina Wussler Echtle. While she did not emmigrate when Texas was still a Republic, her story is fascinating and I find myself in awe of her and people like her who made the same sacrifices. Carolina emmigrated from Gengenbach, Baden, Germany in the latter part of June in 1883, to the United States with eight children . Seven more children were born to her and Martin Echtle, but they died in Germany before the family emmigrated. Carolina and her children embarked at Antwerp, Belgium for New York on the ship Silasia, and it took 14 days at that time to make the trip. After arriving at New York, they at once left for San Antonio, Texas, where she met her husband, Martin, and oldest son, Joseph. 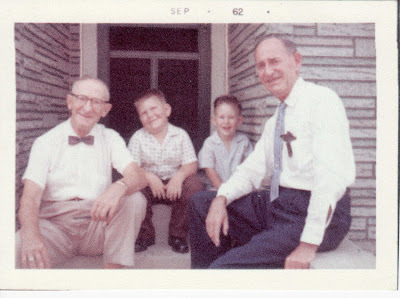 Martin and Joseph came down from Iowa to meet the rest of the family, as they had left Germany a year or so earlier. I can't imagine traveling anywhere with 8 children, much less on a ship across an ocean to an unknown place! Upon her arrival in Texas, Carolina found her husband, Martin ill and died shortly after their arrival. 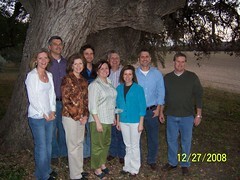 The family settled in Boerne where they stayed for two years. They then moved to Bulverde until 1887 when they moved to Geronimo, Rio Medina. They stayed until 1902, then moved to a farm near La Coste where family members still reside. The family was very poor. They had no stove, but Joseph (oldest son) built one with rocks outside the house. They often wondered where their next meal was coming from. Most of the meals were made from flour, such as "noodles," "dunes," "pluda," "Knepfla" and "phana-kucha" as well as "kartofel soup." They seldom had meat, as they had only one of two hogs to kill in the winter time. The older girls worked as maids for families in San Antonio. Mix in a shallow bowl and then with a spoon or knife, cut off pieces from teh dough while in the bowl, straight into the boiling water. Boil for 10 minutes and drain. Note from Andrea--this is suspiciously like German spaetzle that I learned to make when my husband and I lived there 1995-1998! Well, I didn't even go on to talk about my cemetery excursion, but that has to wait for another day! This trip "home" gave me the impetus to begin blogging to keep me on track with my research and to share, as well learn from others. I scanned a lot a photos from my parents and I have uploaded those to Flickr. I find that the "Add a Note" feature is useful when you do not have the luxory of sitting down next to someone to get their assistance in identifying people. My parents can log into Flickr and make comments on the photos or add a note so that I can properly record names and places! Yea! I also joined find-a-grave online and began uploading my gravestone photos from the St. Louis Catholic Cemetery. Lastly, this trip gave me the inspiration to begin grouping my records into some sort of story. When I acquired the photos of Carolina Wussler Echtle from Frances, I logged into Ancestry.com to find the family on the ship's manifest and when I did that, I also found the photo of the ship! Most of the Alsatian settlers came into Galveston and I have not been able to find those records on Ancestry.com. I was unable to visit the cemetery where Carolina was buried, but hey, I have to have another reason to return to my roots to continue on with my story! I hope you enjoyed hearing about my genealogy trip home and finding out all that was produced out of a simple desire to scan photos and gravestones from one cemetery! Here is another tombstone from the cemetery in my hometown, Castroville, Medina County, Texas. The cemetery is called Saint Louis Catholic Cemetery, and is still in use and managed by the Catholic Church. August was a Civil War Veteran from Ohio. He is one of the few ancesstors that I have that was not an Alsatian immigrant! After the war, he settled in Castroville and married a widow with three children, Catherine Mehr Schmitt. They had 8 more children together. Catherine immigrated to Castroville with her parents, Joseph and Anastasia. The Joseph Mehr, Sr. They were from Oberentzen, Alsace, France and the family came to Texas in or about the 1840's. 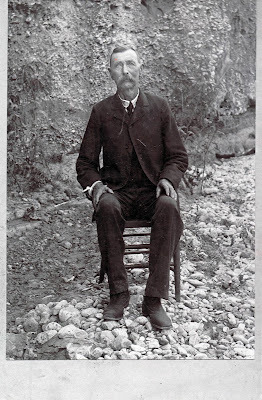 They settled in the Bader Settlement four miles west of Castroville, whre Joseph cleared the land and took up ranching and farming. 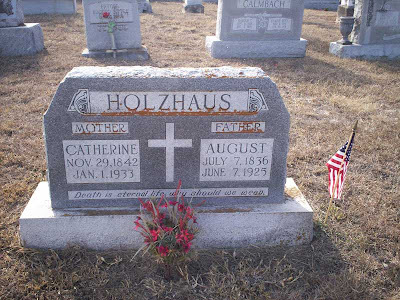 I blogged about August Holzhaus' photo earlier, in a Wordless Wednesday post. Keeping with Technolgoy (or trying to)! Well, my blog is supposed to be about genealogy not technology, but I am finding these two interests of mine converging. There is also an overlap with my day job, school libray media specialist! Most often, I learn about new technology from other bloggers. I read their blogs for the content, but I also look a their layouts, widgets, and basic features that they are using to see if I can apply some to my own blog. I am constantly trying to keep up with technology to pass along techniques to my students, use with my students to better impace their learning or use in my genealogy "world." I find that many websites have their own blogs and if I subscribe to their RSS Feeds, I can "hear" about their latest innovations as soon as they advertise them. Ancestry.com has a blog and that is where I learned about the features of My Canvas. I even watched the tutorial last night, having missed the "live version," I was able to catch up in the archives because of a post by Stefanie Condie. Flickr, the photo sharing site has a blog. So does Twitter. The Footnote.com blog is how I keep up with that site's newest acquisitions. YouTube has also joined in the blogging arena. My previous post discusses how in the world I keep up with all of these blogs without losing my mind! Put these feeds in your Reader or iGoogle page or you will not be able to keep up! Most people who will be reading this blog will probably be aware of RSS Feeds, but you may have friends or colleagues who do not understand the possibilities that open up to you when you start to subscribe to these feeds. If you have a difficult time understanding or explaining the concept to someone else, I find the most helpful tutorials come from a company called Common Craft: Explanations in Plain English. They ingeneously put up "low tech" video tutorials to explain the most technologically advanced concepts and they are so fun to watch! The video on RSS feeds is one of my favorites. Their tutorial on Wikis was one of my first introduction to their videos, but if just type "Common Craft" into the YouTube search engine, you can see all of their video clips. I did watch the one on Twitter, but I found that the blog entry put up by Thomas MacEntee on Facebook Bootcamp for Genea-Bloggers and more was brilliant and more useful for applying it to genealogy. Lastly, there is one blogger in the technology world that I follow because he focuses on web 2.0 social networking sites. His name is Pete Cashmore and his blog is called Mashable! He describes the site as, "Founded in July 2005, Mashable is the world’s largest blog focused exclusively on Web 2.0 and Social Networking news. With more than 5 million monthly pageviews, Mashable is the most prolific blog reviewing new Web sites and services, publishing breaking news on what’s new on the web." So, while I am not entering information into Legacy Family Tree, scanning documents for uploading, searching for records on Footnote.com, Ancestry.com, FamilySearch.org, etc., reading blogs from all my new found genelogical friends, you can find me lurking in the techie world trying to learn what is the next best thing out that will help make my world a bit easier to navigate! Since I made my New Year's Resolution to become more active in the blogging community, I find it increasingly difficult to find the time to read through all the wonderful blogs that are out there! Blogger has a wonderful feature to assist and that is when offered, click on the "Follow Me" button and the person's blog feeds will show up in your dashboard when you log into Blogger. I love this feature because it is easy to do and a very visible way to monitor who is reading your blog! All of your blogs are visible on one page with the latest 3 or more posts visible. You set up the parameters. This is different from a reader because in a reader, you capture all of the blog posts until you read them and/or delete them or mark them as favorites. I find that I am too busy to want to see everything that has ever been been published and that if I monitor my iGoogle page daily, I can quickly see at a glance what is "happening." If I find a particularly interesting blog post in my iGoogle page, I can click on the blog heading and a new Internet window will launch. I can then browse that blog and go back in their history as long as I want! 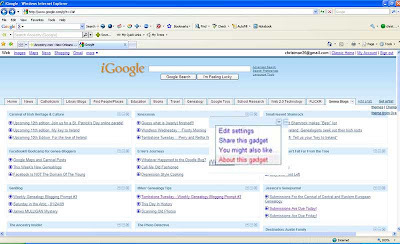 You can personalize each iGoogle tab any way you want with numberous themes. For variety, each tab can have a different theme. You can name the tab anything you prefer. You can easily delete RSS feeds, add RSS feeds, and move the RSS feeds around on your page so that your favorites will be at the top of the page. 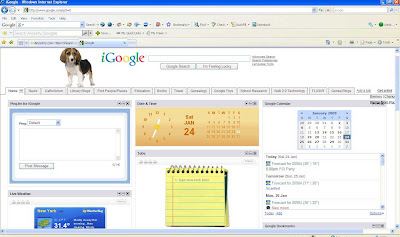 There are numerous widgets that you can add for ease; i.e., clock, calendar, things to do list, translator, ping widget to update your status in other social networking sites, etc. It does tend to take a few minutes to load, especially if you have a lot of feeds on the page/tab. Since this is not a Reader, the set number of posts keeps updating and the oldest ones "drop off" iGoogle. If you really want to capture EVERY post from EVERY blog, then this would not be the format for you. You can see my ping.fm widget so that I can quickly update my "status" (I update to facebook and twitter) from this site. Why would I do that? I work in a busy high school media center (library) and I do not have time to do much "personal" social networking, so I find that if I keep my iGoogle page up at work, I have access to my calendar (which my husband uses and we sync it with our Outlook calendar at home), my "things to do list" my blog postings and my status updater. Also, facebook is blocked at my school, so at a minimum, I can still update my status even if I can't log in! If I come across a neat website or blog or article that I would like to share, I can quickly put it in my "status" and let my friends and colleagues know about it. You can see that enlarged the box in one of my feeders (top row, in the middle) and these options give you the ability to quickly share the feed with someone, delete it, or change it so that you can see more blog posts than the default of 3. You can also select the "You might also like" option and Google will try to find you more feeds like the one on your page. You also have the capability to share the entire tab with someone. This is great if you want someone else to read the same blogs as you; maybe a friend, colleague or genealogy group, etc. Well, I hope that I have given someone a peek at my attempt at how I organize all of the wonderful information on the World Wide Web and maybe you can use some of the ideas that I have shared with you! Genealogy Blogging Prompt #3: Participate in weekly blog themes: Tombstone Tuesday, Wordless Wednesday, etc. Many genealogy bloggers post photos of grave stones on Tombstone Tuesday or a photo worth 1,000 silent words on Wordless Wednesday. Participate in these informal events or invent your own. 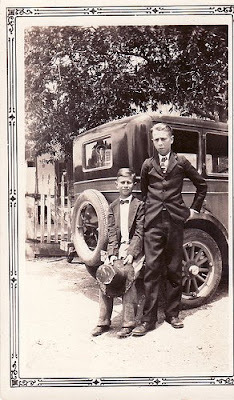 I have been catching up on my genealogy blog reading and I have noticed a common thread on Tuesdays: Tombstone Tuesday. I saw on Kinexxions today that Becky Wiseman credited Amy Crow on her blog, Amy's Genealogy, etc. Well, whomever came up with the idea, I think it is fantastic! Here is my first blog entry for Tombstone Tuesday! 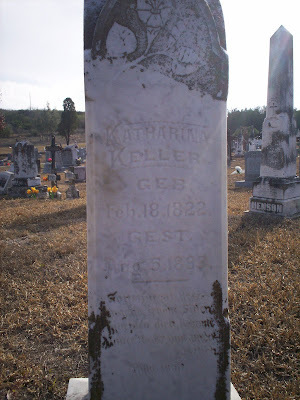 Katherina Dreyer Keller, my great-great grandmother. The text is in German because the early immigrants mostly spoke the Alsatian dialect, which is very Germanic. Katharina Dreyer was born in Ranspach, Alsace, France on February 18, 1822. She immigrated to the United States with her parents, Martin Dreyer & Catherine Lotheringer Dreyer. Their ship, "Heinrich", left Antwerpen, Belgium in December, 1843 and arrived at Galeveston, Texas in March of 1844. Katharina was on the same ship as her future husband, Andreas Keller. She travelled with her parents, four sisters and a brother. 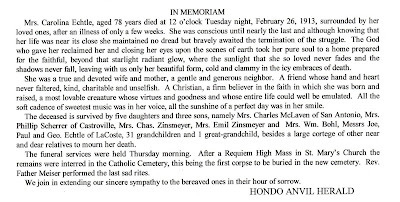 Catherine Dreyer, the mother, died enroute to Texas. 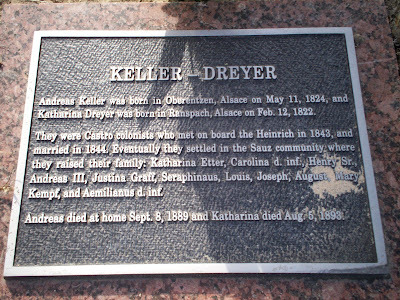 Martin Dreyer Dreyer & three of his daughters settled in Castroville. All the people who came on the ship had to camp in San Antonio for nine months before they came to Castroville. The emprassario, Henri Castro, was delayed and did not arrive until September of 1844. Some people camped among the ruins of the Alamo during those long months. 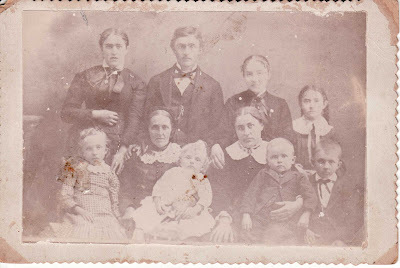 Katherina and Andreas had nine children after they settled in Castroville. Katherina and her husband Andreas were among the original settlers of Castroville, Medina County, Texas and since they settled in Texas while it was still a Republic, they entitle me to apply for Texas First Families as well as Daughters of the Republic of Texas, if I get all of my paperwork together! Topic: Participate in carnivals. A carnival is a showcase of bloggers' posts on a given topic. Word Prompt: The word prompt for the 10th Edition of Smile For The Camera is Costume? No, not as in Halloween. 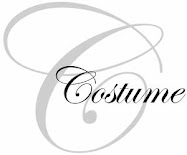 Costume as in dress in general; especially the distinctive style of dress of a people, class, or period. Show us that picture that you found with your family collection or purchased that shows the costumes of the rich to the not so rich, from the civil war to the psychedelic sixties. I know you have them, so share. Admission is free with every photograph! This photograph was one that I found in my paternal grandfather's ancestral home. They had many, many photographs and fortunuately for us, most were labeled! This one was labled on the back with the name, O'Toole. The only problem is that that is not a family name! I will need to research my paternal great grandmother's siblings and see who her sisters married because I have a feeling that it is from one of those families. I think that this photograph dates from the early 1900's and I have always loved the photo from the first moment I saw it lying in the box! It was taken at a studio in San Antonio,Bexar County, Texas. The boy probably lived in San Antonio or my ancestral hometown, Castroville, Medina County, Texas (about 30 miles West of San Antonio). The boy looks as if he is going riding! I love his short pants, black stockings, straw hat, riding stick and most of all, the black, button shoes! Adorable! I guess you wouldn't catch many modern day boys in an outfit like that! Someday I hope to identify him by his first name and family! 1. Upload your favorite picture and talk about it on your blog. Answer the who/what/when/where/why of the subject matter and explain why it is your favorite. I don't know if this is my all-time favorite photograph, but it is my "latest" favorite! Who: My maternal grandmother, Eva Albina Tschirhart Keller. All of her grandchildren called her "Mother" and it must be because her youngest child, my Uncle Burnell, was born later in her life and he was only 7 years older than me! I guess he called her "Mother" and the name stuck with the grandchildren. My own mother was called "Mom" and that is how we told the difference between the two women! 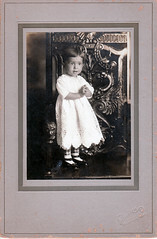 When: Eva was born Dec. 1913 near San Antonio in a small town named LaCoste, Medina County, Texas. She was one of three children born to Idella Rose Haegelin and Edward William Tschirhart. I would assume she is between 2-3 in this photo which would date the photograph around 1915-16. 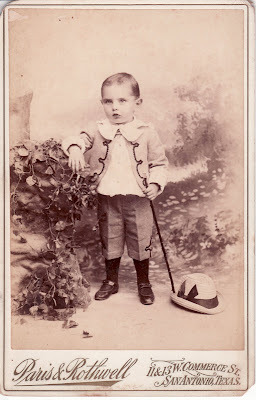 Where: The photo is imprinted with the photography studio "Stein" and location "San Antonio". This makes sense as my grandmother lived her entire life in a small town 30 miles west of San Antonio. Most of the old photographs in my possession are taken in studios located in San Antonio. Why: I don't know exactly why this photo has captivated me, but it could be because of the wonderful, warm and nurturing memories I have of spending time with my grandmother. She was a "quiet" giant! She ruled the roost without letting my grandfather realize it. I love the look on her face in this photograph; sort of a look of anticipation. Her hands are clapsed as if to say, "is this right?" I totally love the little crochetted dress, black, patent-leather, buckle shoes and adorable plaid leggings! My grandmother always had a flair for fashion and we always wondered how a simple, small town girl who grew up to be a farmer's wife learned this flair, but obviously, she learned it early! My most cherished memories are of her taking me shopping in San Antonio and stopping for lunch in the tearooms of the department stores (Joske's and Frost's in particular!). Boy did she love to shop! Wow! 2009. Where did the time go? I have set some personal goals for myself, in my daily life for 2009: 1) daily personal prayer and scripture study, 2) Pray the rosary on a regular basis, and 3) continue with some sort of community service (see next paragraph). For Christmas 2008, my husband and I were blessed to be able to offer our time to the homeless, elderly and/or poor at the Basilica of the National Shrine of the Immaculate Conception in Washington, DC. We acted as servers for tables of people dining on a traditional Christmas dinner sitting at tables decorated with fresh flowers and candles. Words cannot express the deep satisfaction that we felt at being able to serve God's people and for 4 hours we were on our feet without worrying about ourselves! It was liberating! I want to continue this service in 2009. I will spend at least five hours a month working on my genealogy - especially those brick walls that I have. I will print off current family group sheets and update my research. I have done this before, but the files are in need of serious updating since the most printing was done in 2001. I will update all my sources in my Legacy program. I don’t like seeing undocumented genealogy, so I need to start updating and adding those sources. I will find sources for everyone in at least one direct line of ancestors. I will add more information to this site. I get sidetracked and don't update in a long time and I think people stop visiting because they don't see anything new! I will start posting photos on this site as well as my Flickr page. I have been blessed with so many old family photos, that it’s a shame not to share them. I will get re-organized with my CLOOZ. I started using CLOOZ about 5 years ago and it was a tremendous help in getting all of my paperwork organized so that I could find things quickly. I am starting to see piles of paper again and need to start adding new documents into CLOOZ and filing them away properly! I want to visit a Family History Library in 2009 and start using the wealth of information that they have to offer. I want to complete at least one of my Texas First Family forms and mail them off to the the Texas State Genealogical Society. I have been diligent about gathering the correct sources required as proof, but now I need to act on it! I hope that everyone has a great and productive 2009 and I wish you an abundance of health and happiness!!! Christmas 2008 was a time of re-connecting with family and friends and here is a shot of the Nine 1st cousins from Andrew & Lucille Kempf. I think when we are young, we take for granted the special bonds and traditions established by our families. We are all very close in age and went through school together and shared many of the same friends, or brothers and sisters of friends! It was special to visit and catch up and see the next generation that this one produced. And boy, are they growing up...Michele's oldest, Alison, will be getting married this spring. I think I am feeling older now! I have learned some lessons from 2008 and already made some changes! Not only did I pull out my camera more often to document our time together, I uploaded the photos to Flickr and Facebook to share them and I made a back up CD in case of technology failure! Boy that IS an improvement!